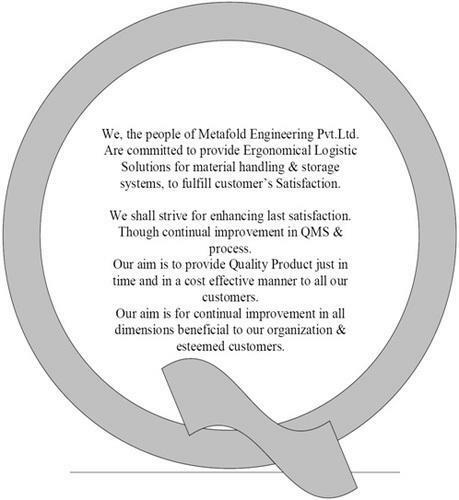 We at Metafold Engineering Private Limited consider quality as something of high importance. Thus we manufacture the offered range in accordance with the set industry norms and guidelines, utilizing the finest raw materials and advanced technology. Owing to this, the offered products are widely acclaimed for its superior capacity, performance, strength, speed and longer service life. In addition, the offered products post production, is sent for a number of quality examinations, for reasons of eliminating all manufacturing defects. We at Metafold Engineering Private Limited are committed to provide ergonomical logistic solutions for material handling & storage systems, to the satisfaction of our clients. We shall strive for enhancing customer satisfaction, through continual improvement in QMS and process. We aim at timely delivery of quality products in a cost effective manner to all our customers. Our continuous improvement in all dimensions should be beneficial to our organization as well as our esteemed customers. • FEM 9.311 – 1978 : Rules for Design of Storage & Retrieval Machines – Structures. • FEM 9.831 – 1995 : Basis of calculation for Storage and Retrieval Machines – Tolerances and clearances within warehouses. • FEM 9.851 – 2003 : Performance Data of S/R Machines – Cycle Time. • BS EN 15512:2009 Steel static storage systems. Adjustable pallet racking systems. Principles for structural design.